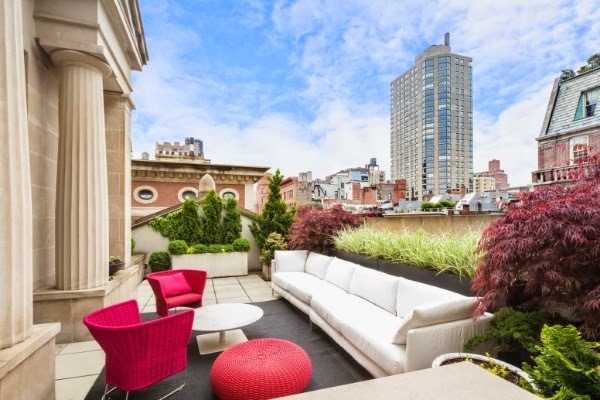 Nestled in the heart of New York City, is the former penthouse of Jimmy Choo co-founder, Tamara Mellon, which is on the market for $34 million dollars. The 7,000 square foot home is a French-style duplex, consisting of 5 bedrooms and 6.5 bathrooms. Built in 1913, the penthouse is a designated New York City landmark. Once inside the penthouse, you’re greeted by 12 foot high ceilings and walnut hardwood floors. There is a private elevator that helps navigate throughout the house, where you will come across a chef’s kitchen, 3 fireplaces, and maid quarters. The duplex is surrounded by terraces that cover 5,000 square feet of outdoor space. One of the terraces even includes a 60 inch flat screen television that is perfect to watch games and shows while still enjoying the outdoors. What does your dream New York City home or apartment look like? With November almost upon us, it’s time to start planning your Thanksgiving, and with the Macy’s Thanksgiving Day Parade one of the biggest moments of the month, a trip to Manhattan is an ideal November getaway. 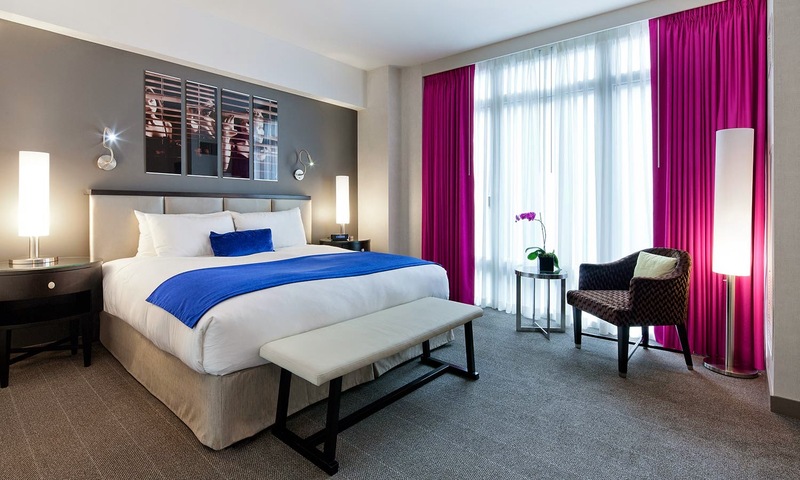 The Gansevoort Park Avenue hotel boasts chic modern interiors in its 249 rooms and suites. The rooms, which are adorned with plush feather beds and goose down pillows, also include the finest cotton linens with views from the room’s balcony. On your downtime, head to the Exhale Gym and the Exhale Spa, where you can pamper yourself and stay active. The heated indoor and outdoor rooftop pool, along with hotel bars and dining will keep your Manhattan stay relaxing and rejuvenating. Not every home owner or renter is blessed with their dream kitchen that has counters that stretch throughout the space, a beautiful island that can house a sink and enough counter space to prep meals, or a sit-in area for your family to enjoy their meals. Most kitchens are in fact on the smaller side, or aren’t designed for all of our needs and wants. If it’s not practical to knock down a wall or complete a major kitchen renovation, there are a handful of ways to make the impression that your space is larger than it truly is. The three key factors to remember are appliances, storage, and lighting. In regards to appliances and storage, if possible, installing compact appliances will give you more room to play with for cabinets and storage space. If there is enough room in your kitchen, an island in the center can double as both counter and storage space, and possibly even as a counter to eat on. In regards to cabinetry, glass doors are ideal, as they allow your guests to see more of the cabinet, which in turn gives the feel of more space in the room. 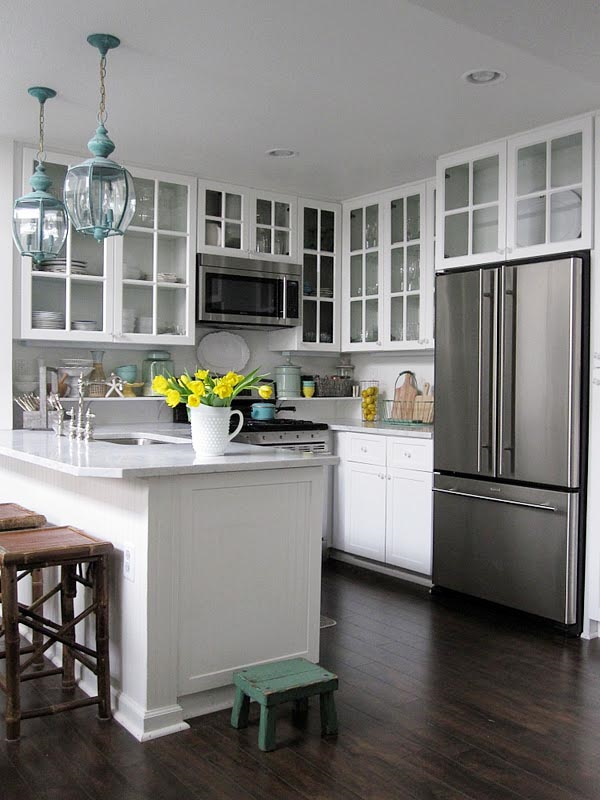 Open shelving; along with clutter-free counters create the illusion of more space in the kitchen. Having the proper lighting in your kitchen can quickly and easily add room to your space. 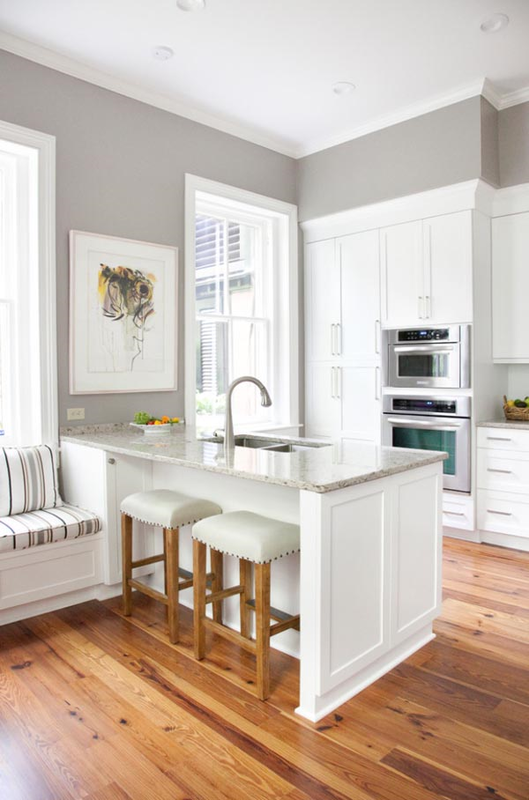 Opting for no window treatments will allow for more natural light to sweep into your kitchen, while lighting under cabinets or counters can also make a similar impact. What is your favorite way to create the illusion of a bigger kitchen?